Separation of state and religion, or any ideology. A pluralist parliamentary order based on free election. Choosing the type of state by an elected constitutional congress, or direct popular vote. 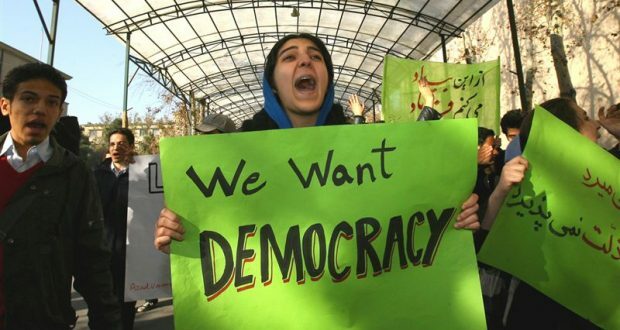 A Transitional Council formed by the main pro-democracy Iranian political groups shall carry out that transition. The invitation of the Founders Group for convening the Transitional Council is open to all organizations and personalities who accept the four principles above. The invitation is, therefore, open to all freedom-loving republicans, constitutional monarchists, Iranian ethnic groups and parties, parties of the left, liberal democrats and religious believers in a secular state. All of those political forces should be represented in the Transitional Council to confer and decide on a successful strategy for transition to democracy in Iran. As members of the Founders Group, we would like to introduce ourselves to you, and request that in connection with the forthcoming Warsaw Conference on Iran, the following letter be forwarded to your Foreign Minister as an urgent matter at the heart of the Conference’s subject, i.e. terrorism.